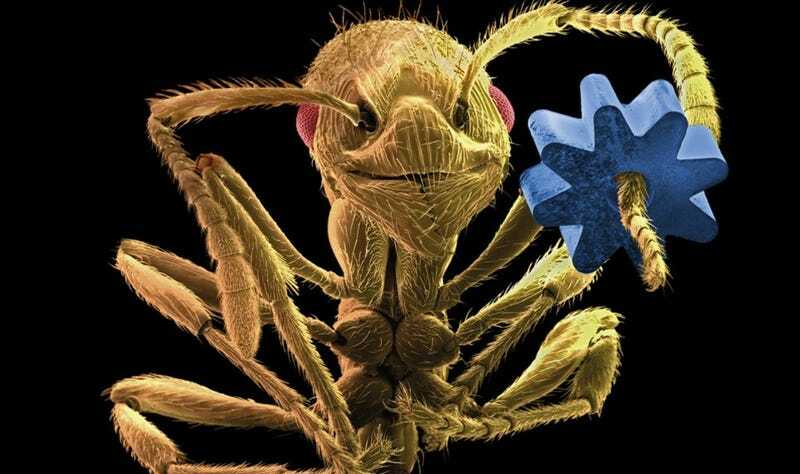 This is an electron micrograph of a leafcutter ant holding a gear that's just 0.1 mm wide. This astonishing image was created by Manfred Page, and it's just one of 100 great science images featured in a brand new exhibition by the Royal Photographic Society. Skeleton of a chameleon, photo by Dorit Hockman, University of Cambridge. Embryonic development of the Black Mastiff Bat, by Dorit Hockman, University of Cambridge. Over-inflated water balloon bursting, photo by Ted Kinsman. Red blood cell infected with malaria, photograph by Steven Morton.